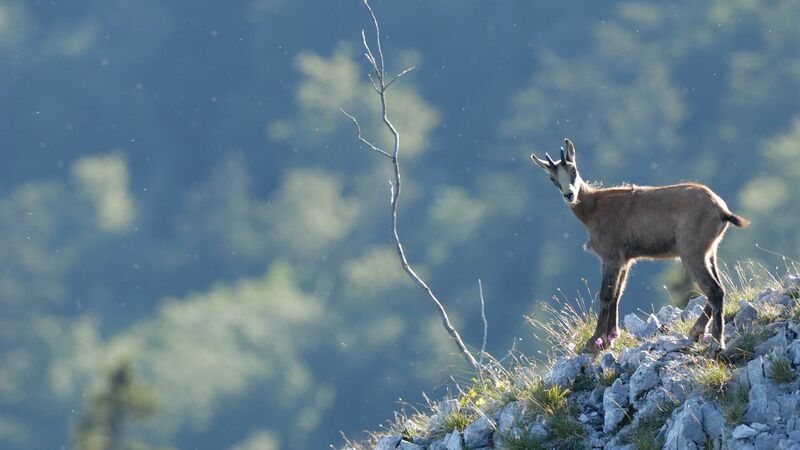 The largest population of Chamois in the Jura Massif (600 individuals) scamper agilely over the scree, the grassy uplands or the forest undergrowth of the Natural Reserve in search of food, leaping from slope to slope, depending on the time of day or the season (Photo credits: RNNHCJ). Anticline : In structural geology an anticline (its opposite is syncline) is a convex fold which has its oldest beds at its core. Steephead valley : A deep, narrow, flat-bottomed valley with an abrupt ending. Glacial cirque : An amphitheatre-like valley formed by glacial erosion. Combes : A steep narrow valley through which a watercourse does not run. Doline or sinkhole: A depression or hole in the ground caused by some form of collapse of the surface layer. It may be caused by karst processes, or suffusion processes. A doline is a characteristic form of limestone erosion. The chemical dissolution of surface limestone rocks leads to the formation of circular depressions that can measure from a few metres to several hundred in diametre. Their lowest point is often covered with clay, more or less impermeable. Accumulation of water here lends itself to the development of a special microclimate and of a rich vegetation which contrasts with the limestone plateau environment. Scree: A collection of broken rock fragments at the base of crags, mountain cliffs, volcanoes or valley shoulders that has accumulated through periodic rock-fall from adjacent cliff faces, caused by erosion or weather conditions. Goya: A man-made pond from 1 to 1.5 metres in depth in which the base has been made watertight with a layer of clay. Such man-made ponds collect water from snow-melt and rain, preventing it from seeping into the karst; thus compensating for the lack of surface water. Karst: A landscape formed from the dissolution of soluble rocks such as limestone, dolomite and gypsum. It is characterized by a tortured landscape and underground drainage systems with sinkholes and caves. Limestone pavement: Surface rock, very easily carved by the flow of rainwater featuring ridges (clints) and gaps (grikes). Moraine: A mass of rocks and sediment carried down and deposited by a glacier, typically as ridges at its edges or extremity. Fold (Ruz): A geological fold which occurs when one or a stack of originally flat and planar surfaces, such as sedimentary strata, are bent or curved as a result of permanent deformation. “Ruz” is a local term from the Jura, describing a hollow collecting rain water which flows down parallel to the slope of the strata. Tetraonidae: Birds in the galliforme family, often large and well adapted to winter conditions. In the Jura they are represented by the Capercaillie and Hazel Grouse. These two species are native to the “taiga” and mountain forests.